HUGE news! The legendary rock band Foreigner have announced a special limited concert series of live shows with the Dave Eggar Orchestra, featuring reimagined hits from their 40-year long career! 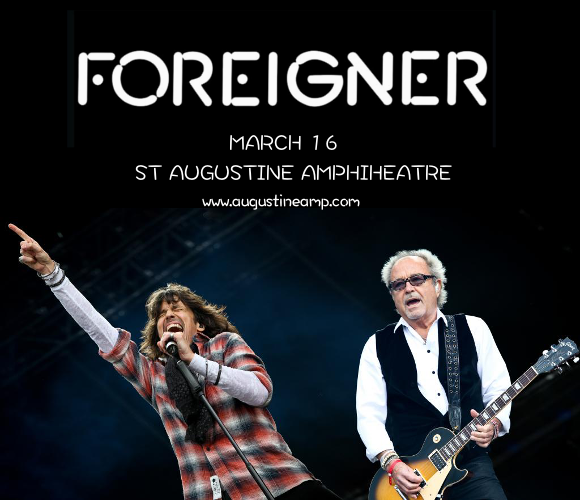 The St Augustine Amphitheatre announces Foreigner & Dave Eggar Orchestra on Friday 16th March 2018. Limited tickets still available – get yours while you can! With huge well-known chart hits still in rotation today, including “Waiting For A Girl Like You,” “Urgent,” “Say You Will,” “I Want To Know What Love Is,” “Feels Like The First Time,” and of course “Juke Box Hero,” Foreigner are one of the best-loved 70s rock bands still around today. In this special concert series, the Dave Eggar Orchestra will bring their classic hits to live in an all-new light! Get ready to experience it all for yourself – book your Foreigner tickets today! !